Bhubaneswar: A national flag represents the essence of a nation’s culture and its presence is always a force to evoke the national pride. 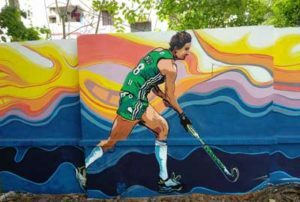 With 16 nations fighting it out at the “Maha kumbh’’ of hockey in Kalinga Stadium Hockey Complex from November 28, the Street Art and Mural Project (STAMP) has taken up the colours of the flags to paint the boundary wall of the stadium complex and in front of it to fill the arena with spirit of hockey. 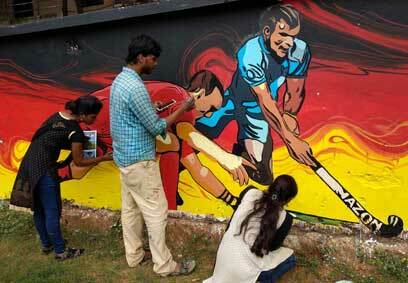 Led by individual visual artist Gopal Krushna Rath and his team of 30 professional artists, students and artist volunteers, the entire area has taken a place of mini “hockey world’’ as the profile images of 16 captains of the participating nations are also going to add to the charm of the visual treat on the walls through STAMP, which has made the beautification initiative of the Bhubaneswar Municipal Corporation (BMC), a unique venture. “We have taken the colours of 16 flags as an element of the background colour on the boundary walls of the stadium complex and on the opposite walls of the stadium, starting from the Tirumala Tirupati Devasthanam Kalyan Mandap and towards the entry gate of New AG Colony,’’ explains Rath. Gopal’s team also has professional artists from New Delhi and they are here to paint and create the beautiful images with local professionals and students. Anjan Patra, Om Pritee and Manoj Choudhary are from New Delhi and are very happy to contribute their share for the STAMP initiative. 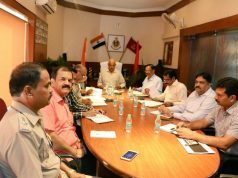 “I am happy that we are contributing towards a World event and the city, which has brought a new name to Odisha in the international sports. 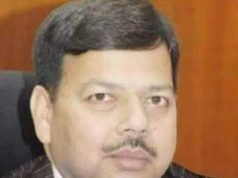 The theme which is based on the colours of the flags of the playing nations is also an interesting idea, as colours give momentum to every dream,’’ said Anjan. Gopal hopes that the team with dedicated painters would complete all the 16 portraits of captains of the playing teams by coming Monday. Till date seven images of the captains are done. During the daytime as the temperature rises and the glare creates problems for the artists many works are taken up during night under lighting arrangements. The participating artists are also dining in group to keep the spirit intact as they are ordering food from eateries. Gopal, a master degree holder in Visual Arts from Utkal University of Culture, had also contributed immensely at the same locations last year during the Asian Athletic Championships in Kalinga Stadium. A seasoned artist with a master touch with the brush, his works are also seen art collections of RPG Group of Industries, New Delhi and Bhubaneswar, Sutra Foundation Kuala Lumpur, Malaysia, IIT Kharagpur, Utsha Foundation, Bhubaneswar and many other private collections in India and abroad. He had also had shows in Indonesia and Malaysia.